8-Track sampler with real-time pitch scaling. The Octatrack is an 8-track performance sampler. Recording of sounds is a breeze thanks to the intuitive user interface, but the fun really starts once the samples are inside the machine. All audio content can be heavily processed and radically transformed. Loops do not have to be restricted by tempo or tone and can always stay in sync no matter if they are pitch shifted or if the tempo of the sequencer is changed. The inflexible nature of samples is finally a thing of the past. With the Octatrack you will be able to treat samples in radical ways. You will appreciate functions like changing the melody of certain sections of a vocal sample without the sample going out of sync. The extensive audio mangling capabilities paired with the user friendly interface make the Octatrack an outstanding studio tool. Thanks to the immediate real time sampling function of the Octatrack you can sample your turntable and instantly play back the recorded loops. Add effects to the captured audio and use the sequencer and the assignable optical crossfader to really add a twist to your set. The Octatrack can be regarded as an extremely flexible second turntable. Each of the eight stereo tracks can stream gigabyte-large samples which is great if you need backing tracks during a live gig. All samples can still be subject to time stretch and can of course also be processed by the effects or rearranged by the sequencer. 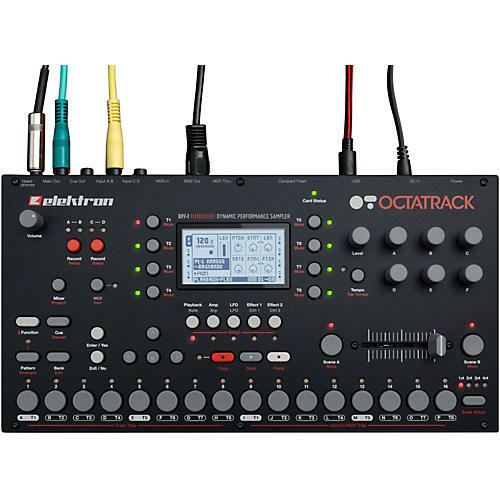 The Octatrack is the most capable performance instruments available. Music is more fun once you get your hands on it. Order Elektron hardware instruments today. Unit power consumption: 8W typical, 18W maximum.